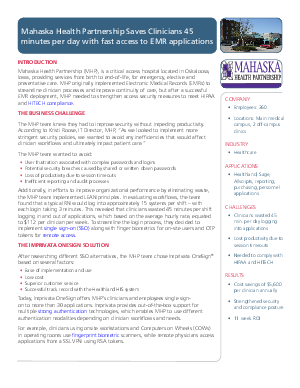 Mahaska Health Partnership (MHP) needed to strengthen access security measures to meet compliance requirements with the implementation of their EMR system. “As we looked to implement more stringent security policies, we wanted to avoid any inefficiencies that would affect clinician workflows and ultimately impact patient care,” said Kristi Roose, IT Director MHP. They wanted to streamline their clinicians’ processes, but at the same time understood that they needed to improve security without impeding on their clinicians’ productivity. With single sign-on Mahaska Health Partnership reported saving its clinicians 45 minutes per day. They were able to improve their hospital’s clinical workflow while at the same time strengthening the hospital’s security posture and reporting requirements.